Stamp or print with a feather to produce unusual images that are ideal for use in a wide variety of projects. Many different items can be used to stamp or print with, but a feather with intricate detail creates images that are particularly good for card making, scrapbooking and other papercraft projects. The elegant feather images belie the ​low-cost nature of this technique and this is certainly a budget stamping project with a difference. The print is made by inking a feather and sandwiching it between two pieces of paper. The print of the feather is captured on both sides of the paper, but the most detail comes from the front of the feather where the shaft is less prominent. Place the feather onto a piece of scrap paper face up. Ink the feather using a brayer. If you do not have a brayer then try rubbing the feather with the ink pad. Make sure that the feather is well inked. Place the inked feather onto a piece of paper. Either place another piece of paper on top or fold the paper into two. Rub the paper well to transfer the ink from the feather to the paper. Carefully remove the feather and leave the paper to one side to dry if necessary. The feather will have left a print on both sides of the paper. The feather print can be used in many ways. Cut the print from the paper and attach it to a card blank to create a quick and easy greeting card. The technique can also be used to create interesting background papers. 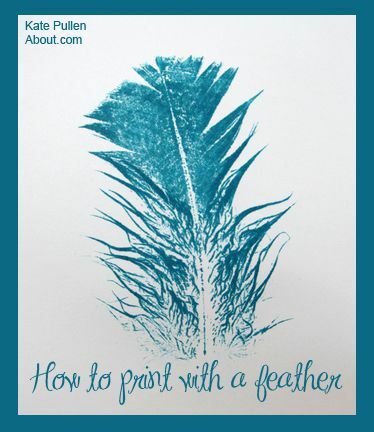 Repeat the technique to create multiple feather prints. Each print is likely to be different which creates an interesting effect.